A quick update on our bee fence. 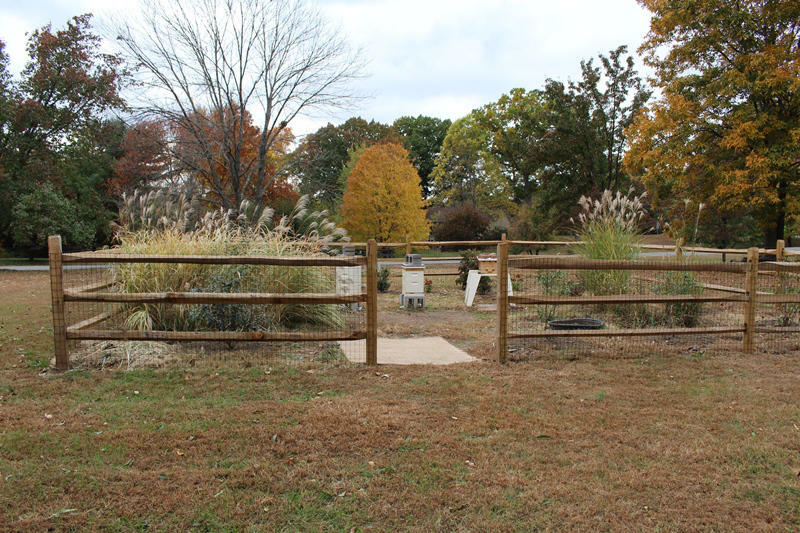 If you’ve been following along, you know that the fence encloses our apiary on the side of our yard. My neighbor used his tractor to dig the post holes, which was a huge help, and I installed the rails over the first few months of the bee year. See my post Bee! I’m Expecting You! for some historical photos of the spot. 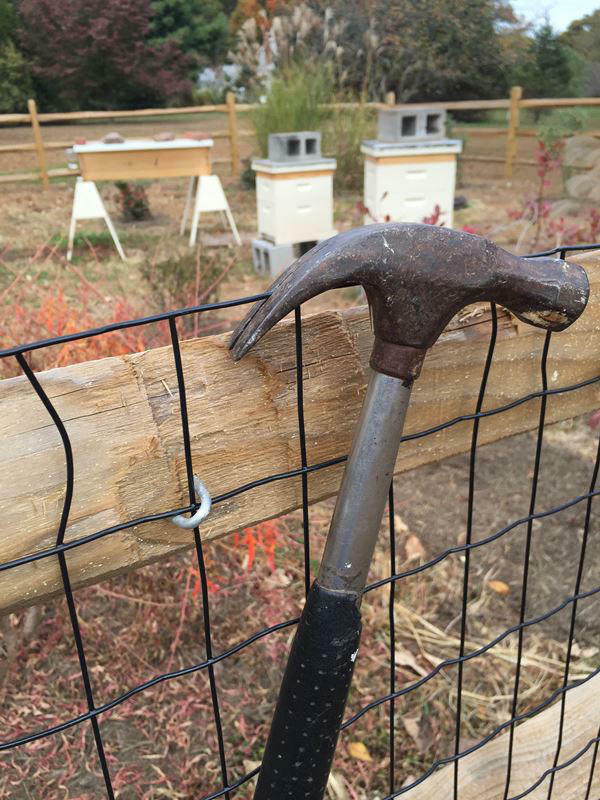 My trusty hammer next to a staple on the fence., with the hives in the background. This weekend I added wire fencing to the existing rail fence. I’ll miss the ability to slip between the rails on any side, which was surprisingly convenient. Hopefully this will keep some of the critters out and break up the wind as it whips across the yard. Not to mention it looks pretty. The galvanized steel is covered in black plastic. I used fence staples to secure the wire to the split rail fence. Roughly 130 feet of wire fencing now encloses the yard, as well as a whole lot of staples. Nice to have it done. Now if only there was a gate…. A before and after picture of the hives through the fence. The 1968 song Bird on a Wire inspired the title for this short post. This was one of Leonard Cohen’s signature songs, and inspired the 1990 movie Bird on a Wire with Mel Gibson and Goldie Hawn. Not a huge fan of the song, but I enjoyed the movie. In any case, this seemed like a good choice for a post about a wire fence. That’s a mighty fine looking fence you have there! Guessing that you don’t have bears, just smaller things like raccoons and skunks since it’s not electrified. Looks really nice! Thanks, Julie. We shouldn’t have bears, though there were a couple reports of bears appearing a few miles away from our house. I was very surprised, as the lots around here are only one to five acres. The hives are visible from the road in our short cul-de-sac so was trying to have something pretty that still created some privacy. Have some room to expand so contemplating my options for the sprint. Hope you’re enjoying the cooler weather moving in. Oh no, that’s worrisome that there have been bear sightings not too far from you house. Black bears have an incredible sense of smell (http://www.nps.gov/yose/blogs/Bear-Series-Part-One-A-Bears-Sense-of-Smell.htm), and the lot sizes will probably not deter them. My last two houses were both in developments with lots about 1-5 acres in size, and I had bear problems in both. Once, a bear actually knocked some panels out of my garage door in an attempt to reach my garbage cans. Maybe they have more year-round sources of food where you are. Up here, they get quite desperate during the late fall. I’ve already been hit by a bear this month. Fortunately, the electric fence stopped him, and he didn’t get any hives. However, I knew he’d been there because the top “rail” was on the ground, and the wires were all tangled up. Your fence looks very sturdy, though, so hopefully that will be enough to keep them out once you add the gate. Julie, yes I know its a bit of a risk, but the way our property is situated its unlike a bear would wander by (at least until I’m proven wrong). I’m sure a bear could climb right over our fence if it wanted. If they start appearing next year I’ll have to consider putting a wire around it somehow. I saw your bear post – very sad to see the frames spread all over the yard. Was glad the fence held him or her up enough to save the hive.